Those who know me well also know that I have a passion for all things blue-and-white, and in my kitchen and living room especially you can see hues of this favourite colour combination, that makes me feel happy and inspired. This timeless colour palette evokes memories of the Aegean with its endless blue skies, and calm seas. 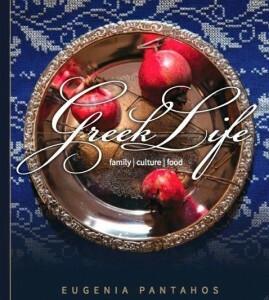 So it follows that when I brought Greek Life (family, culture, food) to life, the front cover would include this beautiful combination, in a truly authentic Hellenic theme. This timeless book inspires readers with the story of family, philosophy, beautiful photography, authentic family recipes and the principles that sit at the heart of the Mediterranean Diet. 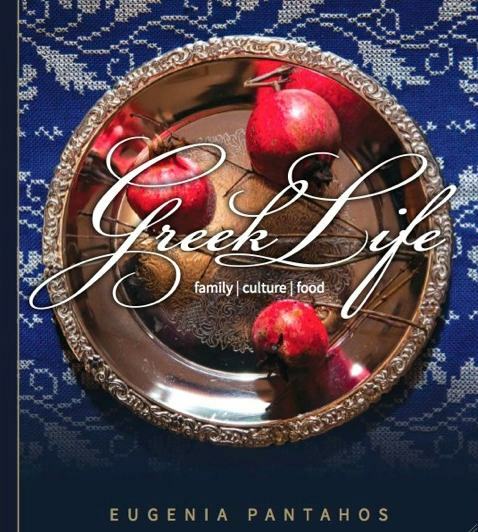 Greek Life makes a beautiful addition to your collection, and a meaningful gift for your loved ones, and sits proudly in homes around the world. Now available as an eBook, a softcover and a hardcover. Have you got your copies yet? 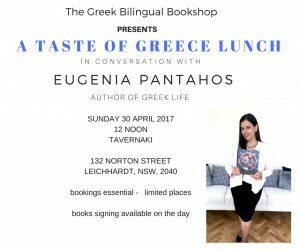 So join me as I invite you to step inside my living room and share my passion for all things blue-and-white, all set to some passionate Greek music. This little video, of course, also features my book Greek Life. 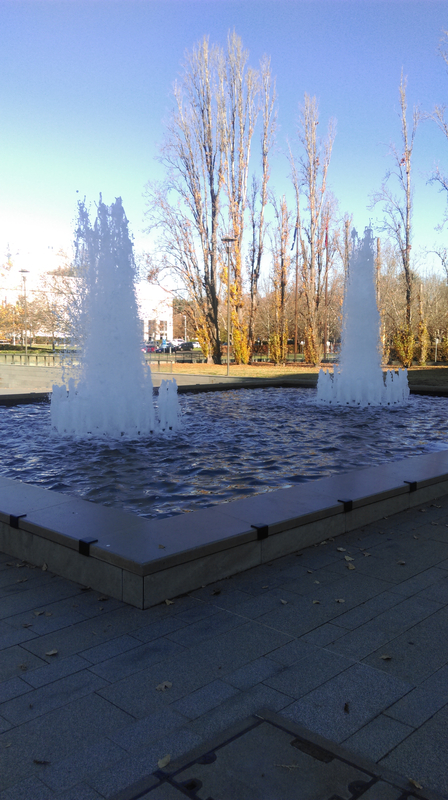 I’ve had a couple of wonderful days in our Capital City, Canberra. It’s the first time that I’ve visited this city, and the aerial view was quite impressive. The people are so friendly, and my taxi drivers were so informative and helpful. 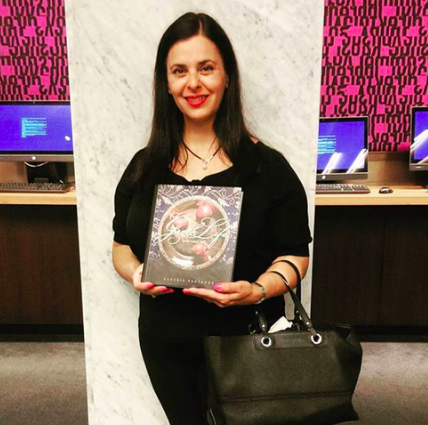 Having been invited to share the story behind my book Greek Life, I was so happy to meet some truly wonderful people who came along to share in my story. 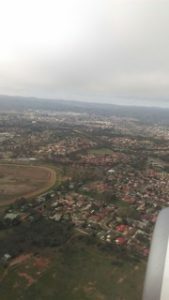 You may remember, that the last blog post was written at Melbourne airport whilst I was waiting for my connecting flight to Canberra. After boarding and settling back in the window seat, a lady named Therese sat at the aisle seat. Introductions were made, and soon we started chatting and it was truly so lovely to meet this wonderful and worldly lady who was heading back to Canberra to visit her friend and her mum. 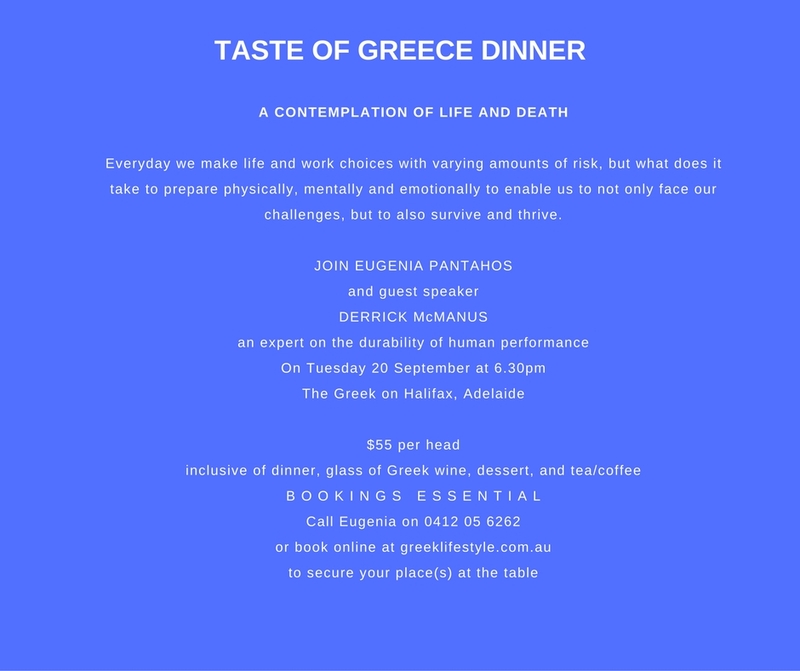 After learning that I was presenting an author talk, Therese said she was hoping to bring her friend Donna to my event at the Hellenic Club. As you can imagine, I was so truly thrilled to see that both Therese and Donna came along to my talk, and that they went home with signed and personalized copies of Greek Life! 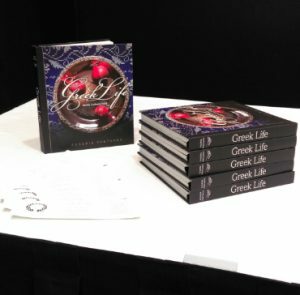 Upon arriving at the Aegean Room at the Hellenic Club, I was also surprised to see that there were people waiting to see me, to chat, and to secure signed copies of Greek Life before the event. A few people purchased one copy, only to come back a few minutes later to buy more. 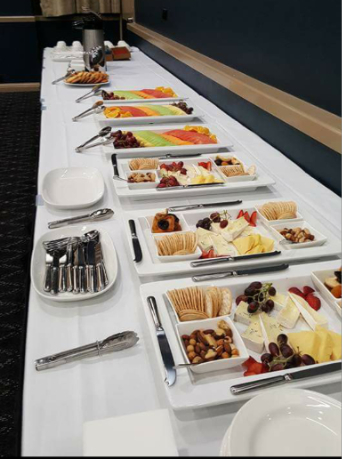 The Hellenic Club at Woden, did a beautiful job spoiling guests with a delicious buffet of cheese, crackers, and platters of fruit prepared by the catering team, served with a choice of wines or tea and coffee. I also wanted to showcase some of the lovely chocolates made by the iconic South Australian chocolate makers, Haigh’s Chocolates, so guests also got to savour some delicious dark pastels. 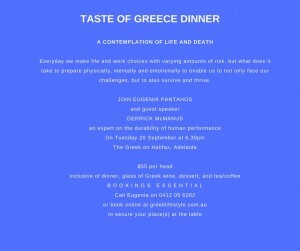 After a wonderful introduction by Yiota, it was my turn to share the story of Greek Life, the story of my family, the philosophy, some personal photographs from our family archives as well as images of just some of the food found in Greek Life, based on the principles of the Mediterranean Diet/Lifestyle. At the end of the presentation, people stayed back and shared with me what the book means to them. The feedback was sincere and inspiring, and I felt so happy to have made meaningful connections with those who came along. After a chat with Yiota, and meeting the President of the Hellenic Club, it was off to bed for me, but not before enjoying a sneaky night-cap (ok…a glass of wine)! 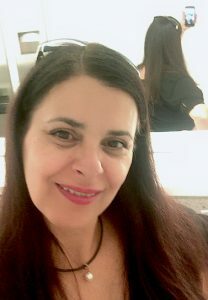 After a restful sleep, and some peppermint tea, I caught up with a family friend for a delicious and healthy brunch at 80/20 on Lonsdale Street. I managed to squeeze in some sight seeing, with my first stop being the National Library of Australia. I signed up to become a member so that I could request that my copy of Greek Life, that was gifted to the Library when first published, could be brought up so that I could have a photograph taken. It was such a beautiful and special moment in my journey so far. Naturally, this auspicious occasion deserved a little personal celebration. The National Library has a lovely cafe and in the spirit of celebrating in style, I decided to order some sparkling wine (the sign did read ‘press for champagne’) and a serve of a coconut and raspberry cake; scraping off the rich cream cheese topping of course! It was a little decadent, and I loved every minute of it. This private moment of stopping, acknowledging, and celebrating is just as important as the journey. You see it has taken much dedication, vision, strategy, commitment, and determination to make this happen. To back myself, to live a dream out loud, whilst also being a daughter, sister, wife, and mother to 3 amazing girls. 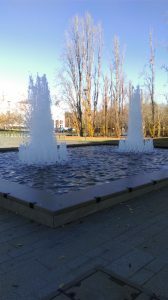 After my little celebration I continued taking in some of the main sights of Canberra, taking a lovely stroll to the National Portrait Gallery, which is an absolute must visit when in this city. The photo to the left is my own ‘self portrait’ titled ‘Rear Mirror’. A little bit of fun in the ladies; I hope you like it (insert wink)! I admired the work of some amazing artists and in particular I liked the portrait of Carla Zampatti (Australian Fashion Icon), Paul Grabowski (Musician/Composer), Ronnie Tjampitijimpa (Indigenous Australian), and a tall striking portrait of a judge (the name escapes me). I meandered my way to the National Art Gallery and was captivated by the beautiful composition and shimmering colours of Monet’s Water Lillies, a must do if you’re in our capital city. On the lower ground floor on the way back to the cloak room I got see some amazing indigenous art, before taking a taxi for a quick stop at the Kingston foreshore for a promenade whilst having a wrap-up phone call with Yiota before heading to the airport to take a direct flight home and be reunited with my family. 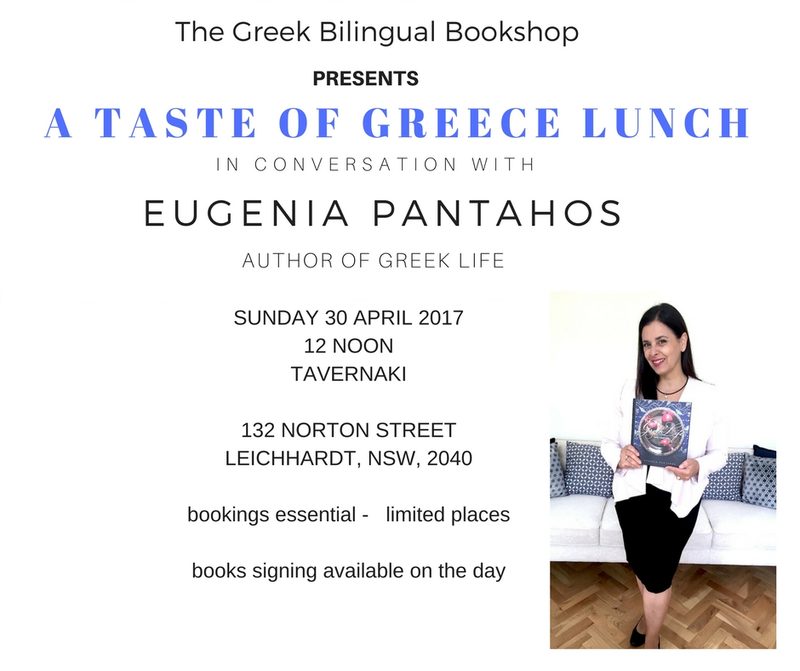 If you’re living in Canberra, and missed the talk, or if you did come along and would like more copies of Greek Life, then please visit Yiota Eleftheriou at the Hellenic Club at Woden. There are limited copies of Greek Life in stock there, and that means you’ll save on the postage and handling costs. So now’s the time to secure your copies. It’s never too early to get your loved ones a timeless and beautiful gift for Christmas, or graduations, birthdays and more! Thanks for joining the celebration that is Greek Life, and thank you for your continued support! 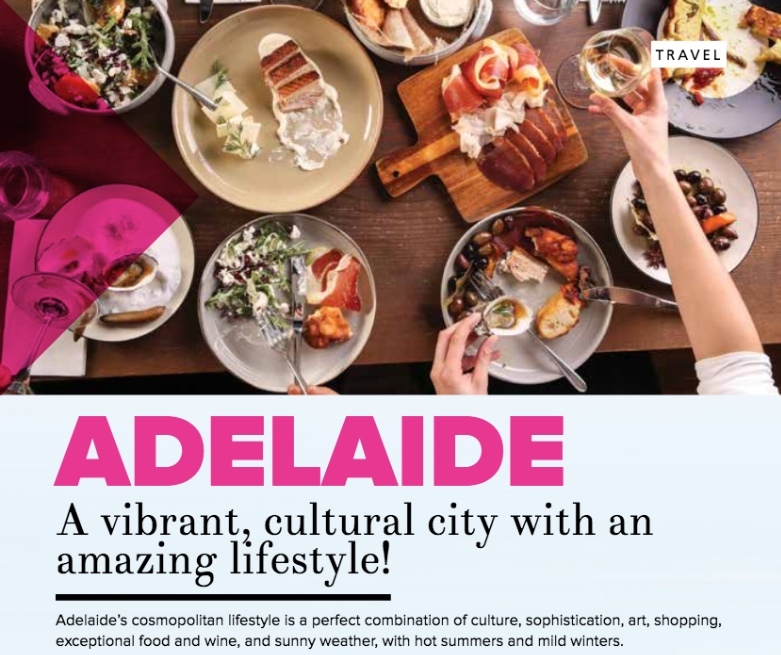 Adelaide – A vibrant cultural city with an amazing lifestlye! Recently I felt inspired to make home-made Pastelli, a specialty from the island of Zakynthos, from where my father’s family is from. I engaged my intuitive cooking skills and the science of cooking to come up with a recipe that is both golden in colour, and quite simply delicious. 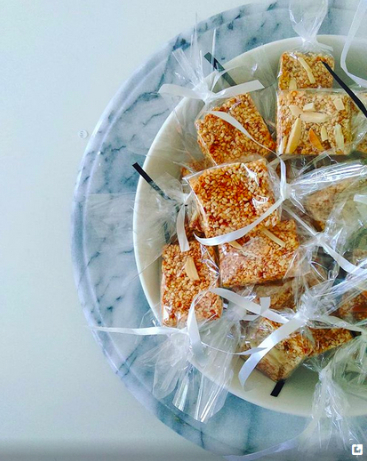 The addition of a hint of vanilla sugar, and freshly grated orange zest makes these original health bars just that little more aromatic and enticing. Having rolled the mixture quite thin and cutting it into little squares makes them perfect for popping into your mouth. I much prefer them this way rather than having to bite into this crunchy and chewy mixture. I cut pieces of clear cellophane to carefully wrap each piece of Pastelli and then finish them off with lengths of pretty ribbon tied into bows, before placing these beautiful little confection treats into my favourite footed sweets bowl ready for serving. This recipe has a little crunch, so care needs to be taken of one’s teeth….alternatively just simply pop one into your mouth and allow these little sesame seed bars to tantalize your taste buds. Here’s my recipe made with love, and brought to you with love! Pretty Pastelli all wrapped up! Place the sesame seeds into a dry heavy based frying pan and toast gently. In another saucepan heat the honey until it begins to bubble, add the orange rind, sugar, and vanilla sugar. Stir well over low heat until sugar is dissolved. Transfer the toasted sesame seeds into the honey mixture and mix well. Place baking paper onto a glass board or marble slab, or other smooth surface. 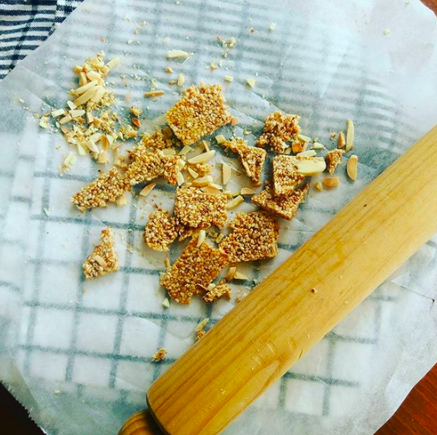 Working quickly, pour the mixture onto the baking paper, spread with a blunt knife, sprinkle with the toasted almond slivers, place another sheet of baking paper on top, and roll the mixture out thinly using a rolling pin. Remove top layer of baking paper, and using a sharp knife proceed to cut the Pastelli into square or diamond shapes. Allow to cool completely. Pastelli can be stored in airtight container but you’ll need to place a clean sheet of baking paper in between each layer, to prevent them from sticking together. I like to wrap mine individually in cellophane and tie with a pretty ribbon. 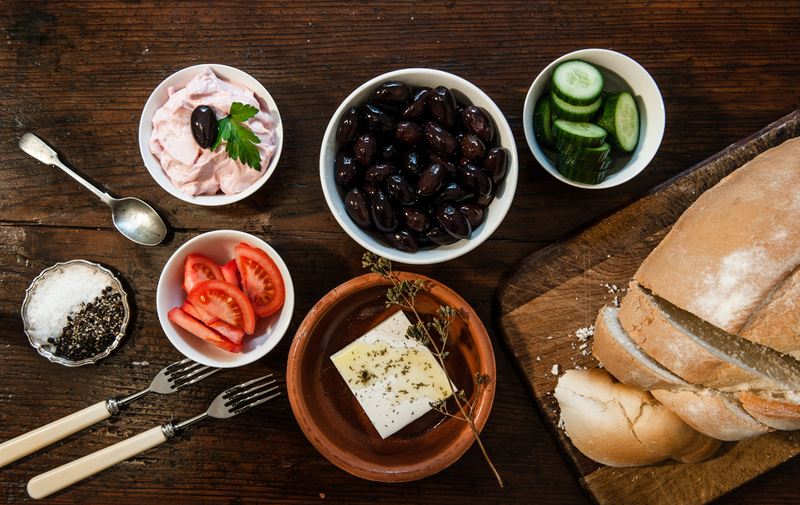 Place the Pastelli into your favourite bowl to have available for your visitors to enjoy (that’s if your family can resits them) and serve with a glass of iced water and a Greek coffee!